Mirabou storks inhabit the savannas. Marabous have an enormous sharp bill, capable of dealing lethal blows. It is wedge-shaped to cut open bdominal walls of dead animals. The birds are scavengers with bare heads adapted for insertion into large animal corpses. Subse-quently, they are found in association with vultures. They also stand at termite mounds eating swarms of insects and have been known to kill young and adult flamingos and small mammals. They can drive away vultures, but are not generally particularly quarrelsome. They eat anything remotely edible, including old rags. 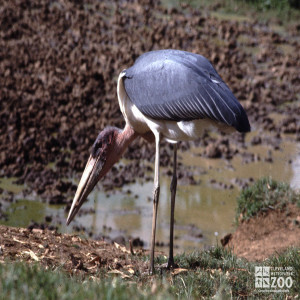 Eggs are laid at the end of the rainy season so that young marabou storks are fed during the dry season where there is more food and aquatic animals are concentrated in receding waters. The young take 116 days until they fly and leave the nest at about 130 days.